Pam at a meeting of groups to strengthen civil society. Curt at one of his math teaching seminars. 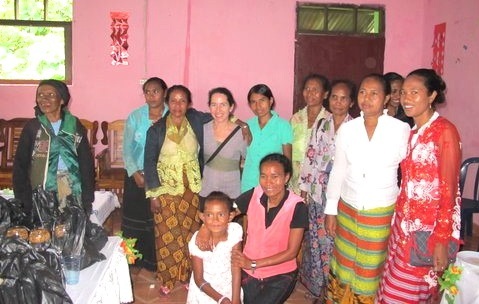 From 2012 to 2013 IF supported a project focusing on Grassroots Capacity Building and Science Education in Timor Leste. Community organizer and parent educator Pam Sexton has been a committed human rights advocate, speaking to US groups about East Timor for 15 years. Pam is an executive committee member of the US-based organization, East Timor and Indonesia Action Network (www.etan.org). Science educator Curt Gabrielson of Watsonville has spent several years developing a way to use local materials and cultural knowledge as a basis for hands-on science education in Timor Leste. Collaborating with local science teachers (whom he trained) he has produced two breakthrough educational resources written in the local language. The IF-supported component of Pam and Curt's projects ended in 2013. They announced their future plans in Timor Leste on their blog in late 2013. "We arrived in Timor a year ago this month. As we wrote at the time, we had a few short-term contracts lined up, and just enough money in savings to get us established in Timor. We also had the good support of IF, a non-profit group in our hometown of Watsonville. IF’s commitment to supporting us in transitioning our family to Timor and beginning our work here was instrumental in us making the decision to come. If you were among those who donated, we thank you from the bottom of our hearts. In the last two months we have both finished up other work and taken contracts with the Timor-Leste Ministry of Education to work with a team that’s revising the curriculum for primary school, Pam in the area of humanities, Curt in science and mathematics. Curt will continue working part-time with the group of science and mathematics teachers (SESIM) in their work training teachers and creating hands-on curriculum, and Pam will continue working to support local organizations. We came to Timor-Leste to do work supporting social justice and education, not to make money, though we do need to earn a living. Our current contracts provide steady and secure salaries as well as the flexibility to continue with other commitments. For this reason, we’ve informed IF that we no longer need their financial support. We do, however, hope to continue the relationship of solidarity between Timor-Leste and IF, an organization that has a great deal of experience offering international solidarity. We encourage you to check out their website http://www.integrities.org/index.html and the projects they continue to support in Mexico and elsewhere. We’ve been honored to be connected with this small, local group and their humble and yet powerful international vision. The tiny nation of Timor-Leste (East Timor) may be easy to overlook, but there are compelling reasons for us to stand beside this struggling country. Almost 20 years ago Amy Goodman, Noam Chomsky and others turned our attention to the atrocities committed in East Timor by the Indonesian military. Our government sided with Indonesia on this one, and provided the arms. By the time Indonesia left, one-third of the Timorese population was killed and the country’s infrastructure demolished. Then the international community swept in. You’d think that a decade of international aid would change things. In reality, the people have experienced what Pam calls “trauma on top of trauma,” including predatory capitalism and post-conflict violence. Much of the country still looks like a disaster zone. The aid agencies have largely shut the people out of the decision-making for their own future. Whereas other poor countries pin their hopes for a brighter future on educating their youth, Timor-Leste’s schools lack any real math and science component. Timor‐Leste stood at a critical crossroads as the U.N. prepared to leave the new nation by the end of 2012. IF’s programs there helped create conditions for self-transformation for the people of Timor-Leste to emerge out of their crisis. IF’s Timor‐Leste project managers Curt and Pam planned to work to expand on the hopeful alternatives they have cultivated in civil society activism and popular education. Curt and Pam relocated their family to Timor‐Leste to continue contributing their exceptional skills, perspective and experience toward participatory development efforts within the new nation. Science educator Curt Gabrielson has produced two breakthrough educational resources, Ensiklopedia Multimedia Siensia no Matematika iha ita nia Moris Loroloron, Volumes I & II (Multimedia Encyclopedia of Science and Mathematics in Everyday Life, Volume I & II). Written in the local language, the Encyclopedia covers 83 math and science topics, illustrating how each topic is used and understood in everyday Timorese life, and outlining simple activities around each topic that can be performed in any classroom in the country using common materials. A multimedia Ensiklopedia CD is now in nearly every school in the country as a resource for science and math teachers to make the connection between abstract concepts in the texts and the experience of the students. • Support the official formation of the first Timorese group of science and mathematics teacher trainers. • Work with this group to carry out hands-on, locally relevant training to teachers throughout the nation. • Identify sources of ongoing funding to make these teachers’ work sustainable. Support broader participation at the grassroots in community-based organizing and advocacy around key policy decisions related to health, education and sustainable agriculture. Strengthen the effective communication between grassroots Timorese organizations and individuals/organizations seeking to stand in solidarity with them.